French verbs and their conjugation seem to be the most exasperating part of French grammar for students. There are quite a number of French tenses and moods (I will write about those in a future article) and it is very easy to feel overwhelmed. As a result, many students buy dictionaries specifically dedicated to French verbs. Honestly, if I were a French student, the mere sight of these dictionaries would discourage me! Do I have to learn all that??! Good news : the answer is NO. There is an easy way you can dramatically reduce the amount of memorisation (and headaches!) 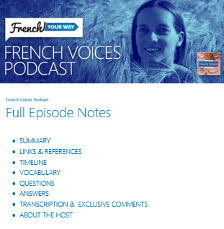 to learn the most commonly used French tenses! The following recipeshas helped many of my students. I have created a downloadable PDF : “The Most Common French Tenses Made Easy” so you can easily print this out if you find it helps you too. simple exercises & their answers. 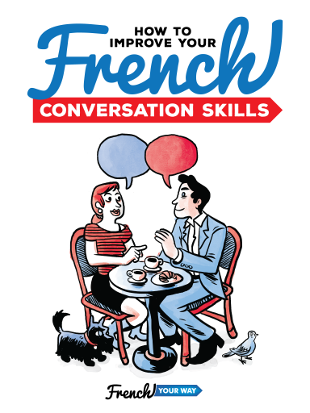 Note: This article is addressed to students who already have notions of French tenses / conjugation. The recipes provided aim at making learning and memorizing easier, but they are not lessons in themselves. 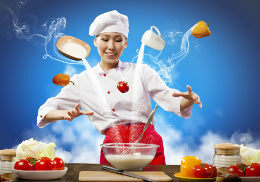 French Tenses Made Easy in 7 Recipes: The secret! The present tense (which is actually called “indicatif présent”/”indicative present”, but is often referred to as “present” by default). There are ways to learn how to conjugate verbs in the present rather easily. *Of course, French grammar wouldn’t be French grammar without its exceptions, for example “être” in the imparfait (imperfect) tense. Nothing is perfect indeed ! Ex2 : je regarde, tu regardes, nous regardons à « regarder » is a verb with one unique stem (regard-) in the present tense. the ending (“terminaison”) is the part that you attach to the stem of the verb. With each person and each tense goes a specific ending, which you need to learn. So now, let’s do a bit of verb cooking to bake fresh and healthy French tenses ! the same form as the imparfait ! Don’t forget that you can easily print these French tenses recipes and test yourself with the PDF below. If you’ve found this article helpful, please pass it on! 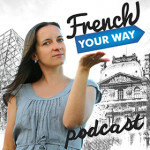 Also if you like this article, you may also like French Your Way Podcast. Merci!